On the Feast of the Meeting of the Lord, the Church commemorates an important event in the earthly life of our Lord Jesus Christ (Lk 2: 22-40). On the 40th day after birth the God-Infant was taken to the Jerusalem Temple – the centre of religious life of the God-chosen nation. By the Law of Moses (Lev 12) a woman, having given birth to a child of the male gender, was forbidden for 40 days to enter into the Temple of God. After this interval the mother came to the Temple with the child, so as to offer to the Lord thanksgiving and a purification sacrifice. The MostHoly Virgin, the Mother of God, did not have need for purification, since without defilement she had given birth to the Source of purity and sanctity, but in profound humility she submitted to the precepts of the Law. At this time there lived at Jerusalem the righteous elder Simeon (the account about him is located under the day of his commemoration – 3 February). It had been revealed to him that he would not die until he should behold Christ the Saviour. By inspiration from above, the pious elder went to the Temple at that very moment when the MostHoly Mother of God and Righteous Joseph had brought there the Infant Jesus, so as to fulfill the ritual ceremony of the Law. The God-Bearer Simeon took the God-Infant in his arms, and having given thanks to God, he uttered a prophecy about the Saviour of the world: "Now lettest Thou Thy servant depart, O Lord, with peace according to Thy word, wherefore hath mine eyes beheld Thy salvation, which Thou hast prepared before the face of all peoples, a light to the enlightening of gentiles and the glory of Thy people Israel" (Lk 2: 29-32). Righteous Simeon said to the MostHoly Virgin: "Behold, This One is set for the fall and rising up of many in Israel and for the sign spoken against, and for Thee Thyself a sword shalt pierce the soul, so that the thoughts of many hearts might be revealed" (Lk 2: 35). At the Temple also the 84 year old widow Anna the Prophetess, daughter of Phanuel (Comm. 3 February), "who did not leave the temple, serving God both day and night in fasting and prayer. And she also at that time, having drawn near, glorified the Lord and spake about Him (the God-Infant) to all awaiting deliverance at Jerusalem" (Lk 2: 37-38). Before the Birth of Christ, all righteous men and women lived by faith in the Future Messiah the Saviour of the world, and they awaited His coming. The final righteous ones of the closing Old Testament – Righteous Simeon and the Prophetess Anna – were deemed worthy to meet at the Temple the Bearer of the New Testament, in the Person of Whom both Divinity and humanity do meet. The Feast of the Meeting of the Lord is among the most ancient feasts of the Christian Church. It is known, that on the day of this solemnity were proclaimed sermons by Sainted Bishops Methodios of Patara (+ 312), Cyril of Jerusalem (+ 360), Gregory the Theologian (+ 389), Amphylokios of Iconium (+ 394), Gregory of Nyssa (+ 400), and John Chrysostom (+ 407). But in spite of its early origin, this feast was not so solemnly celebrated until the VI Century. During the reign of Justinian in the year 528, a catastrophe befell Antioch – an earthquake, in which many people perished. And upon this misfortune there followed others. In the year 544 there appeared a pestilential plague, daily carrying off several thousand people. During these days of widespread travail, it was revealed to a certain pious christian that the celebration of the Meeting of the Lord should be done more solemnly. When at the day of the Meeting of the Lord the all-night vigil was finally made with church procession, the disasters at Byzantium ceased. In thanksgiving to God, the Church established in 544 that the Meeting of the Lord should be done more solemnly. Church melodists adorned this feast with many a church work of song: in the VII Century – Sainted Andrew ArchBishop of Crete; in the VIII Century – Sainted Cosma Bishop of Maium, Monk John Damascene, Sainted Germanos Patriarch of Constantinople; and in the IX Century – Sainted Joseph the Studite, ArchBishop of Thessalonika. 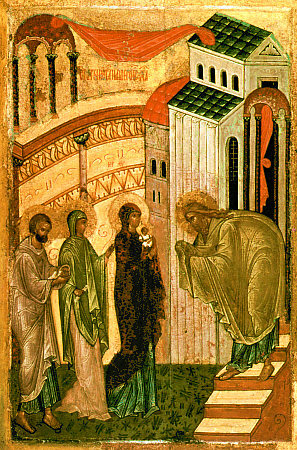 With the event of the Meeting of the Lord is associated the icon of the MostHoly Mother of God named: "the Softening of Evil Hearts" or "Simeon's Prophecy", which it is necessary to distinguish from the icon "Seven Arrows". The icon "Simeon's Prophecy" symbolises the fulfillment of the prophecy of the righteous elder Simeon: "for Thee Thyself a sword shalt pierce the soul" (Lk 2: 35).